Color me shocked. I was incredibly on the fence about this movie because of the ho-hum trailers and bad first look advertising that went out. Luckily, there isn't a single wasted frame at all, and there are rumors there is even a longer cut featuring more Rogue and future time line shenanigans. Now the movie version is incredibly different from the comic book story it steals its name from, but that is okay because the movie nails the most important thing: Theme. Comic book movies are rarely direct adaptations anyway; Watchmen and Sin City are the exception and not the rule. 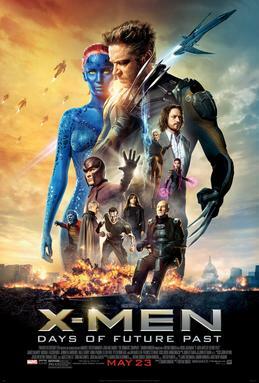 Because Days of Future Past embodies the themes presented throughout the X-Men comics it works as a film, and still doesn't insult the source material. Hugh Jackman is back as Wolverine, maybe for the last time, and he is firing on all cylinders. It is very cool to see the old cast from the 2000 movies get their due too, even if the majority of them were under utilized. Of course Patrick Stewart is amazing as ever as Professor X. It doesn't hurt that his past-self counter part played by James McAvoy is equally strong in his performance. You can really see how the two of them come together to form the same character. The breakout scene though has to be the pentagon escape scene with Quicksilver. I am very curious to see how Age of Ultron handles Quicksilver, considering this film nails the power set in a quick scene, but sadly disposes of him shortly after. I bet the Avengers Quicksilver is going to be more character driven and less 'flash-y', focusing on the bond with his sister and probably Peitro's anger a lot more. It is also refreshing to finally get to see a new villain in action instead of Professor X and Magneto constantly butting heads together. Sure a lot of the X-Men details can easily be narrowed down to point of view and where you think the mutant race is heading, but there are also external non-mutant forces as well. The past-era Sentinels looked amazing, and really stole the show, and the future Sentinels were just harrowing husks of CG mess. Great villains though, incredibly deadly and ominous. And that Apocalypse tease... Can't wait to see the fruits of that labor for sure!